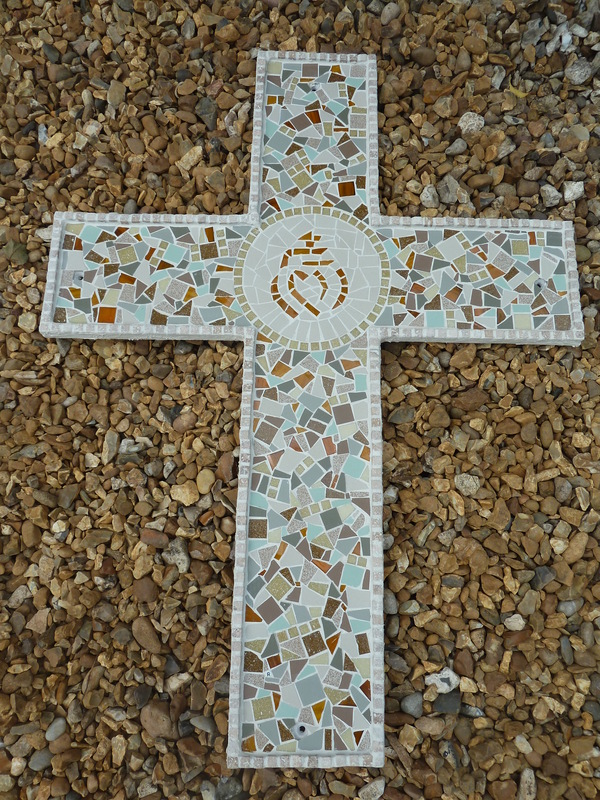 Outdoor mosaics can really enhance a garden, courtyard or patio area however large or small. They are hard wearing and durable and can usually stand extremes in temperature. They add a different dimension to the space and fun. Mosaics are still the ‘undiscovered art form’ for a lot of people so if someone does have a mosaic indoors or outside, it is usually quite a talking point. I have made a large range of outdoor mosaic art. I love talking to the client and finding out what they want from their outdoor space and what feel they would like to create – a sense of fun, calmness, a real show stopper? These lizards are made on large flat stones and can easily sit in a bed or on the patio. This one is called ‘Hopper’ and lives by my sisters pond. Several of Hopper’s brothers and sisters have gone abroad and live in France, Spain and Brazil. I have also done ducks, flowers, butterflies for beds. A large outdoor piece I made a few years ago was this dolphin on a large slab of York stone. It was a commission for a local friend as a wedding present for his wife, and secretly placed in their newly landscaped garden – no pressure then. Luckily she liked it, whew! Mosaic stepping stones are very popular and again, I have made quite a range. You can really have fun with them and they can be quirky or traditional, its totally your choice. To make a real impact you could have a piece of mosaic art hanging up outside against the brickwork, fence or set in to a wall. Quentin (my first commission) and the French Cross are both on a converted Benedictine Monastery in France. 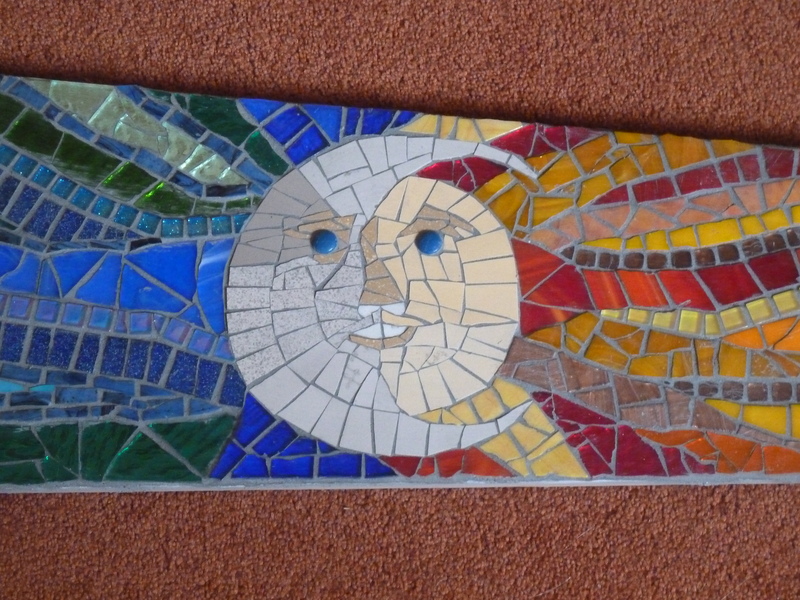 The Sun/Moon panel is in the O’Grady Court residential home and was a present from me to them. The glass-on-glass piece would look stunning in a conservatory with the light shining through to show it off to its full sparkly glory. Of course, my biggest outdoor piece is The Marple Mosaic, which I am really proud of. It was commission by a couple who found my website. They really liked my style of work and felt we had shared values. The piece is very geometric (which is not my usual style) and is my biggest piece and challenge yet. The clients absolutely love it and we have since become good friends. If you think a mosaic could enhance your outside space, please give me a call to discuss the possibilities. No obligation, I am always happy to chat ‘mosiacs’. You can also visit my Outdoor Gallery to get more ideas. Regular readers will know that earlier in the summer I did a voluntary project in the half term holiday with OPEN Ealing and the local children. We collectively made a mosaic tree and then donated it to O’Grady Court sheltered housing in Ealing. It was a great community project to be involved in and O’Grady Court invited us all over for an unveiling session providing a delicious buffet brunch. I was so impressed when I met Birgit and Gasper and they told me all about O’Grady Court and the facilities. They obviously loved the mosaic tree so I offered to make them another mosaic as a present. I returned a few weeks later and discussed options and eventually we came up with the idea of one of my sun/moon mosaics. I wanted to give them a piece that was nice and bright and would sit in their lovely outdoor garden. I had made one sun/moon before for my garden shed but this one was going to be much larger and brighter. I started by drawing in the face and the first things I mosaiced were the eyes. I am really pleased with them because they are the most realistic pair I have done so far. I then did the nose and slash of a mouth. Then the fun part starts, putting in all that lovely colour and bling. For this I used a lot of coloured stained glass so I that I could have really large, bright coloured sections. I then “filled in” the gaps with iridescent tiles, glass beads, metalic tiles and anything else that I thought would add to the piece and make an impact. So having completed and delivered the mosaic, I went along on Friday for the unveiling. As well as Birgit, Gasper and all the residents, Maud from Open Ealing came along and proceedings were introduced by the regional Manager. After a lot of compliments were made and photos were taken, I talked about the inspiration for the piece and how I went about making it. It was a beautiful, bright morning and the mosaic glittered and sparkled in the sunlight – exactly as I had hoped it would. We then went inside for a lovely buffet and I had my first mince pie. I was presented with a beautiful bouquet of stunning autumn flowers – my perfect colours. I really enjoyed making the piece for all the residents at O’Grady Court and I know from their reaction and kind words that they really like and appreciate their sun/moon that will look down on them for many years to come. July and August are such strange months, the roads are deserted but tube trains, museums and London parks are full to bursting with families and tourists enjoying the summer holidays. The mosaic world takes a holiday as well and I have managed to get away myself as it has been very quiet on the mosaic front. I have also taken the chance to have a sort out and tidy my studios ready for the autumn rush – she says hopefully! I made this butterfly during summer for my sister’s newly born great niece. I had made her big sister a pink elephant when she was born 3 years ago so it seemed fair that another mosaic was in order. I have used quite a few ‘glitter’ tiles so it should really sparkle on her bedroom wall. Following on from the fantastic response and reception we got from O’Grady Court on the OPEN Ealing mosaic project, I have volunteered to make them a mosaic to go onto another wall in their lovely rooftop garden. The last voluntary project I did was at the Log Cabin, a children’s charity, so I am more than happy to make a piece for the residents at this lovely sheltered housing organisation. I have had the initial meeting with them and we talked through ideas, where it would be placed etc. After lots of discussion we came up with the final choice of mosaic so it is now up to me to get sketching and decide on the size, colours etc. Hopefully I shall have some progress pictures for you soon. I have just received a new commission for 2 stepping stones. I have made several stepping stones in the past, notably my sundials and the ammonite. They are great fun to do and lend themselves well to the mosaic medium. As they are so durable and robust they are ideal for a garden, flowerbed or patio. This client has asked if I am able to do 2 horoscope star signs – I think that is a brilliant idea and I am a bit disappointed I hadn’t thought of that idea before myself! Obviously I said ‘yes’ so I am now looking at sizes, colours, designs etc. 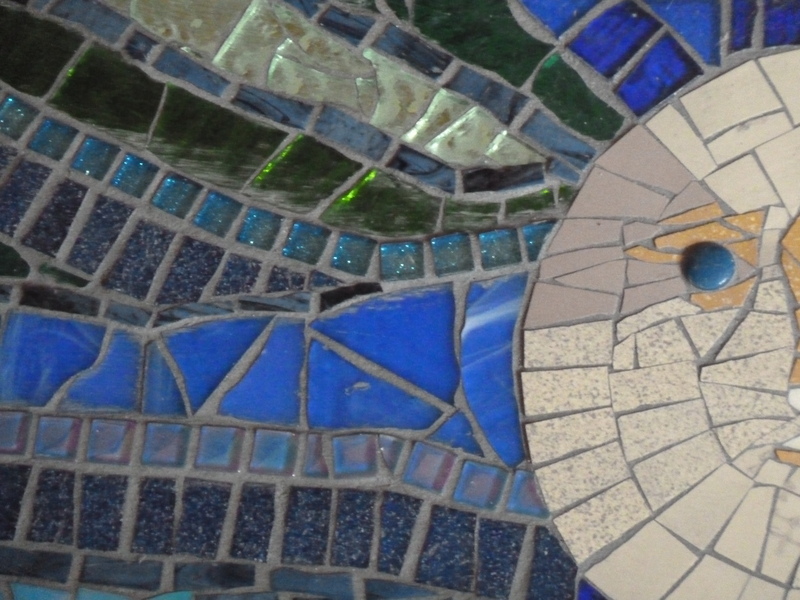 So after the lull of summer comes the storm of new projects – I am looking forward to getting back to work and mosaicing again. LONDON ACTIVITY: So many of my Blogging Followers have been asking me how I am getting on with the CAPITAL RING walk so here is progress to date: We have now completed 7 stages of the Capital Ring and have crossed the river to north London. Combining stages 4 & 5 took us from Crystal Palace to Wimbledon Park via Streatham, Tooting and Wandsworth Commons. Stage 6 was probably one of our favourite routes starting at Wimbledon Park with its massive boating lake and overlooking the City skyline, passing the famous windmill on Wimbledon Common, lovely walking over Putney Heath which took us up into Richmond Park. Now we felt we were on ‘home territory’ but as we went through Richmond Park we crossed through lovely parts that we didn’t know existed. When we walked down past Pembroke Lodge, through Petersham Meadows and to completion at the river by Richmond Bridge, it was great to be able to hop on a bus to get home. Stage 7 was definately our local patch and the walk took us on a familiar route that we have cycled or walked many, many times. The end of the route was literally ’round the corner’ to home! We are sure that the Capital Ring route used to come past the bottom of our road so I am wondering if anyone out there has a copy of the Capital Ring book pre the re-print in 2014. If you have, please do get in touch and let me know the old route. OPEN Ealing is an arts centre that is the focus for creative excellence,inclusion and aspiration. Their aim is to introduce a refreshing cultural space and exciting arts programmes to the community by bringing artists, performers, art groups and residents together, promoting creativity and creating new opportunities. The remit was that during the week children would carry out various art projects ‘Following in the Footsteps of’ a famous artist. To be honest, one of my favourite artists is Rembrandt who’s dark and m0ody self portraits do not lend themselves to a children’s bright mosaic project! No worries, I would decide on the mosaic first and then work in an artist. It was agreed that rather than make individual pieces, we would make one large mosaic which we would donate to a local organisation. Maud identified O’Grady Court, a sheltered housing complex, who were delighted with our offer of a mosaic for their beautiful rooftop garden. My biggest challenge was not knowing how many children would turn up, their ages and artistic ability. I didn’t want anything too simplistic that would not catch their imagination but I was also aware that if the piece was too large I would be doing a lot of mosaicing at home that night! Also, how do a group work on one piece while putting their personalised stamp on it. Eventually I took inspiration from the trees I made for the Log Cabin, lots of different sections with varied styles within the overall piece. Luckily for me my nephew Steven, a maths teacher, was coming to stay for the weekend so as soon as he arrived he was given a cold beer and told to ‘design’ a tree made up of squares, rectangles and other mathematical shapes – all alien to a ‘creative’ like me! On the day 10 children arrived and were immediately attracted to the beautiful glass tiles, shiny ceramic beads and glittery adornments. Working in pairs, they selected the sections they wanted to work on and then, armed with their handfuls of ‘coloured treasure’, started to design their section before placing and sticking them in the main piece. They were totally engrossed and were determined that the mosaic would be finished within the session, so all of them were working flat out. Each section is very individual – some of the children were incredibly neat, others were colour focused, many had an abstract slant. The end result is a fantastic ‘mix n match’ of different styles, all very distinctive but they all work in harmony as a whole. I hope you will agree that our ‘Picasso Influenced Cubist Tree‘ is a great success. Rosanna and Maud prepare to unveil. Residents from a sheltered accommodation complex in West Ealing were presented with a very special mosaic for their garden from some of the young people who helped make it. During OPEN Ealing’s May 2016 half term workshops, youngsters aged 8 to 14 followed in the steps of famous painters such as Klee, Klimt, Kandinsky and Van Gogh, using varied artistic treatments. Led by local mosaic artist Rosanna Henderson, the children collaborated to create a cubist tree. When Rosanna suggested they made a large piece of art to be donated to a ‘good home’, the young people quickly agreed and the communal rooftop garden at O’Grady Court was the natural choice – being in the centre of West Ealing and providing sheltered and supported accommodation for retired people over the age of 55. Birgit Huhn, Manager of O’Grady Court, on Melbourne Avenue, has been extremely supportive of the project from the outset and she and some enthusiastic residents came to OPEN Ealing during the workshop session to see the piece being created. Mosaic Artist Rosanna Henderson with some of the children that made the mosaic. OPEN Ealing wishes to particularly thank the children for their dedication in producing such a beautiful work of art, Rosanna for her skilful lead on the workshop and finishing touch on the piece, our volunteers Ruth Holmstock and Stephanie Sundle for their precious help during the workshop, Birgit Huhn and Catalyst’s O’Grady Court management and maintenance teams for their support of the project, and finally the residents for their enthusiasm. This article appeared in the Ealing Today Newsletter this week. Thanks to OPEN Ealing and AnneMarie from Ealing Today for writing the article and initiating and supporting the project. NEXT BLOG: The story behind the mosaic. I cannot believe we are well into June already – how did this happen and where has the year gone! Of course this time last year, I was busy polishing and wrapping the Marple Mosaic ready to deliver it to my clients in Cheshire. Nerves all round but they loved the piece and we have become firm friends since. This year has seen lots of smaller commissions but I am ready to do another big piece again so if you would like a large mosaic or know anyone who may be interested, please do get in touch. I try to keep my prices reasonable and I work very closely with my clients to make sure they get exactly what they want in their favourite colours. A highlight for me this year so far has been getting my mosaic art into a new Gallery – Coquetdale Arts Centre in Rothbury. I am now displaying my work in 3 venues but am always keen to spread my mosaics art into different areas. Again, if you know of an outlet for my work, I would be interested to hear. I am especially keen to get my outdoor work recognised by the wider public domain. After the huge amount of compliments I received for my Glass-on-Glass mosaic, I am encouraged to make some more of these pieces to order. 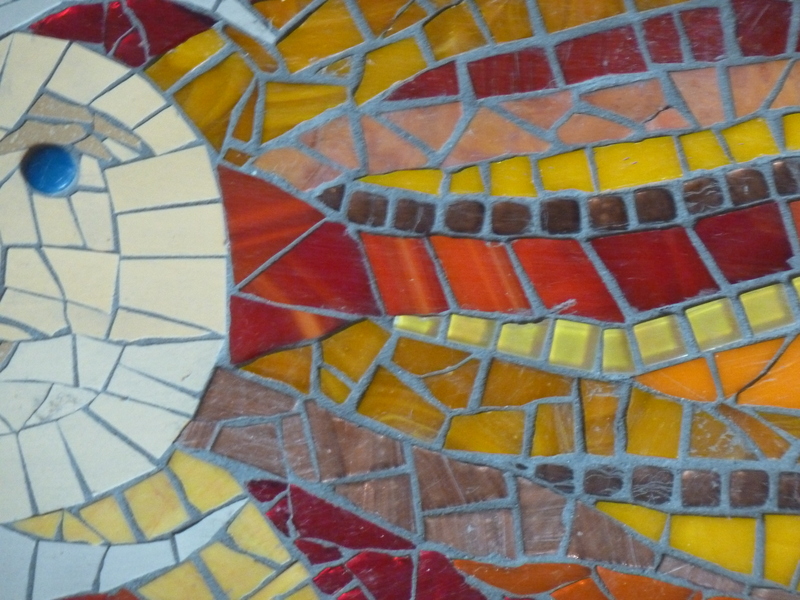 My original mosaic was rather large and quite heavy to hang so I will be making smaller, thin panels that are much easier to hang up in trees, on fences or prop up in a window – any place where the light can shine through them are suitable. I have masses of glass in the whole spectrum of colours – Catherine very kindly gave me her offcuts which I washed individually and colour coded – maybe I really do need to get out more!! I love working with glass and combining it with the more traditional mosaic tiles to give a more interesting and textured effect. I am delighted that as the weather has cheered up I can get back into my ‘Grout House’ to work on my mosaics. There is something really special about being in my outdoor studio and seeing my garden in full bloom as I make my mosaics, a lot of my work is inspired by nature so it feels right to be working in that environment. I am currently working on garden pieces made on porcelain tiles (offcuts from our newly fitted kitchen). They will be very colourful with lots of sparkly glass that will catch the sunshine. The idea is to have a lot of the tile showing so you get the contrast between the slate colour porcelain and the ‘bling’. Here is the work in progress. As always, I love to hear your feedback on my Blog – either through this page where you can post a comment, or you can send me an email. If you have a mosaic questions or a topic you want to know more about, do please let me know. So here is my favourite picture of the year – The Marple Mosaic. Several reasons: my biggest commission to date, my first geometric mosaic which turned out really well, a fantastic story, made great friendships with the clients Hilary and Pauline, moved me up to the next level of mosaic making. My Sun and Moon because I really love this mosaic and see it every day on my shed. Rufus Reindeer because I didn’t want a ‘cartoon’ animal and think I have the right level with him. A VERY HAPPY, HEALTHY AND FUN NEW YEAR TO YOU ALL. THANK YOU FOR FOLLOWING MY BLOG AND I LOOK FORWARD TO SEEING YOU ALL AGAIN IN 2016 WITH MY HIGHLIGHTS FROM THIS YEAR. I spend so much time making mosaics as commissions, for galleries or exhibitions that I very rarely make a piece for myself. However, when I got my birthday garden shed, I knew I would be making a mosaic to go onto it. Initially I was going to make a ‘welcome’ sign with the shed name but as I couldn’t decide on the final name, that piece remains on hold. As I was planting the new garden beds around the shed I suddenly spotted the perfect place for a mosaic, a long triangular inset just above the door. I knew instantly the style of mosaic I wanted and could picture it in my mind. The problem was transposing that complicated idea into such an odd shape, keeping my original concept of the image but making it suitable as a mosaic. Alan was in charge of cutting the exact size board, it would be wedged into the inset so no room for any error whatsoever – no pressure then! We used Wedi Tilebacker Board (the lightweight cousin of Hardie Bakker Board) which is a very flexible compound that can be cut with a Stanley knife but is meant to be robust enough to go outdoors and is weatherproof. It is the first time I have used it so we shall see, best to experiment on myself rather than a clients commission! Once I got going I really enjoyed making the piece. It was done in two sections initially and then we used wooden kebab sticks inside to join the pieces together, plus lots of glue and then gaffer tape. The whole structure was very precarious but I needed to mosaic continuous lines and not have an obvious join. Here is the finished piece in situ – I am delighted with it and am looking forward to having the winter sun shine on it as there is a lot of ‘sparkle’ potential. REQUEST: Let me know what you think – could ‘shed art’ catch on? The first proper commission I ever made was Quentin the Lizard that went to live in France with Nicol and John. I received an email earlier this year from their neighbours, Louise and Marucs, who had always admired Quentin and asked if I could make them an outdoor mosaic. They wanted a large cross to go on their outside wall which gets lashed with rain in winter and then baked in the sun during summer. I knew this meant I couldn’t use my usual outdoor plywood as the wood was likely to warp so I was on a quest to find an alternative material. Fellow mosaic artist Sue Edkins suggested Hardie Bakker Board which is a very tough, composite substance, that is often used to line shower and wet rooms. This seemed the perfect material for this project. Louise and Marcus came round and we discussed the style and effect they wanted to achieve for their cross. We settled on a subtle colour palette of muted shades including tans and moss greens. I used ceramic matt tiles with a few glass tesserae to lift it and add shine. They also said they wanted the Vendee symbol included in the piece as this was the ‘symbol’ for the region of France where the cross was going to go – a bit like our Yorkshire & Lancashire roses. I have always been a bit wary of ‘writing’ or putting symbols into mosaics as it is quite fiddly and if not done well, can look a bit sloppy. However, they were very keen and the client is always right so I took up the challenge! By setting the Vendee in a clear area, it seemed to work quite well and I am pleased with the results. Whew, another challenge under the belt! It was a lovely piece to make and very different from the recent Marple Mosaic commission. I think I have made a pretty good job with the Vendee and when Louise and Marcus came to collect the piece, they were delighted. It is now in situ and here are some photos of it in it’s new French home. I now have 2 mosaic pieces living in France, a growing number of mosaic lizards living all over the world and I have given mosaic lessons to people that now live in Mexico and New Zealand. I think I can claim the title and now say that I am Rosanna’s Mosaics International! REQUEST: If you enjoyed reading this Blog, please pass a link on to others who may also enjoy reading it.